The Fax2840 mono laser fax multifunction centre can deliver outstanding results in a short time with superior technology and innovative features, performing with incredible strength and efficiency. This compact laser fax machine doubles up as a printer and copier. You can rely on this compact machine for all your professional needs.High resolution at 2,400x600dpiHigh speed up to 33.6KbpsUp to 20 sheet Automatic Document feederMemory backup functionWith built-in handset. 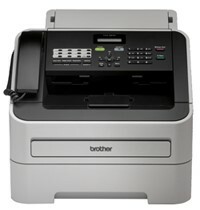 See the manufacturers web site Brother FAX 2840 for more information.